, a divine and antiquary, probably a relative of the preceding, was the great-grandson of sir William Masters of Cirencester, in Gloucestershire. 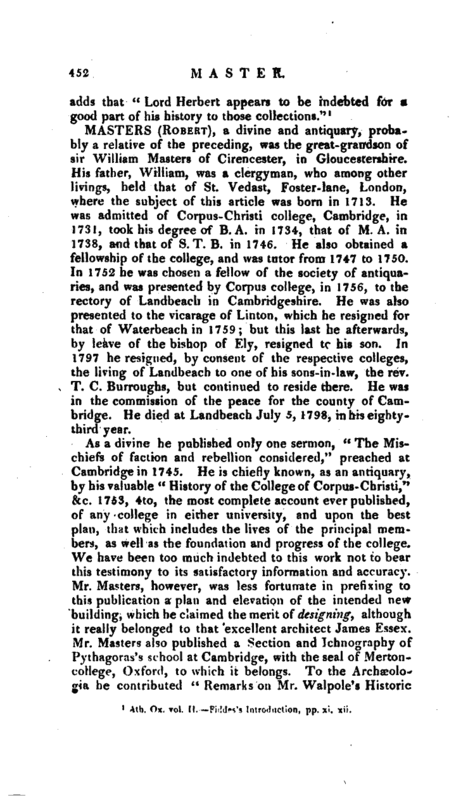 His father, William, was a clergyman, who among other livings, held that of St. Vedast, Foster-lane, London, where the subject of this article was born in 1713. He was admitted of Corpus-Christi college, Cambridge, in 1731, took his degree of B. A. in 1734, that of M. A. in 1738, and that of S. T. B. in 1746. He also obtained a fellowship of the college, and was tutor from 1747 to 1750. In 1752 he was chosen a fellow of the society of antiquaries, and was presented by Corpus college, in 1756, to the rectory of Landbeach in Cambridgeshire. He was also presented to the vicarage of Linton, which he resigned for that of Waterbeach in 1759; but this last he afterwards, by leave of the bishop of Ely, resigned tr his son. 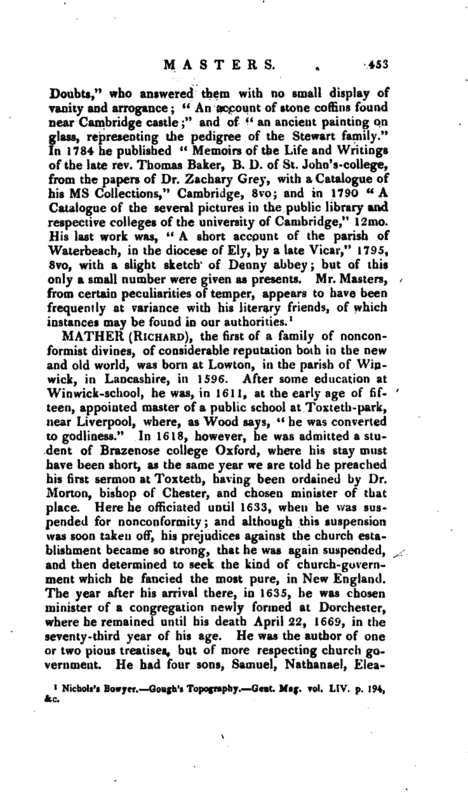 In 1797 he resigned, by consent of the respective colleges, the living of Landbeach to one of his sons-in-law, the rev. T. C. Burroughs, but continued to reside there. He was in the commission of the peace for the county of Cambridge. He died at Landbeach July 5, 1798, in his eightythird year. Nichols’s Bowyer. Gough’s Topography. —Gent. Mag. vol. LIV. p. 194, fca.